I have to admit that I'm new to this group but have been an avid dgrin reader for years. I've decided to leave my job to pursue a different passion (helping photographers get off the ground!). I was wondering if you had any feedback on a recent video I put together that teaches you how to build a photography portfolio website using WordPress. The video is free for now and I hope I can keep it that way. Lastly, totally sorry if this is the wrong place to post this, but I genuinely am just trying to understand what a beginner photographer needs. Thanks so much in advance and I look forward to more amazing discussions here! The link you posted for your video gets a "404 Not Found". What is your background? Just curious about what skills you plan to use to help photographers. I have over 15 years in the digital space, and just exited a company that I founded helping publishers/websites monetize their site. Throughout the process I've helped companies from big to small, including freelancers, establish themselves online, but recently decided to do that on a bigger scale - through videos. My next goal is to zero in on the needs of a photographer, starting with creating a website to building a brand around their work. There's a long road ahead of me, but I'm welcoming any/all feedback! I get the idea that you're trying to make your money helping people build a website, and that is okay, but what does this have to do specifically with photographers? Don't get me wrong, having a pretty website is nice, but in the real world without the business skills to get and keep clients a pretty website is no more useful than owning a pet rock. Do you think that magazine editors or ad agencies are searching google for a photographer to hire? On the backside of that, do you think any of them are searching google for a random picture to buy? Maybe you're thinking that brand new camera owners who want to be wedding or portrait photographers will believe that having a pretty website is the answer to their dreams, but I don't see it. Now if you were talking about blogging, that would make more sense to me given your stated background on monetizing a website. That at least would be useful information in my opinion. 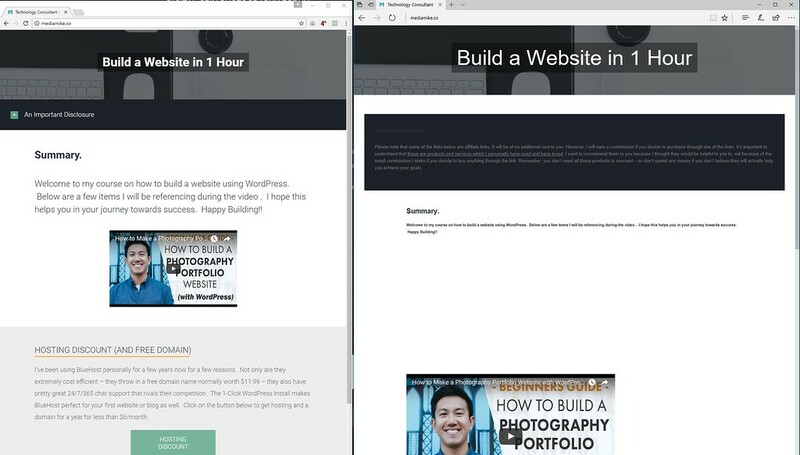 Honestly, taking an hour to watch a video on building a Wordpress site is more time than I am willing to spend. And as Steve said in his post, a website does not make a photography business. This is great feedback guys. I really appreciate it. I do want to say that my intentions were never to declare that having a website was the be-all and end-all answer to becoming a successful photographer, and I apologize if it came out that way. My goal is to merely help facilitate in the process of creating a business. In this case, the tutorial focuses on creating a website. However, how one can leverage a website it to help grow a business (e.g. through blogging, etc.) is a different beast and a separate topic that I plan on covering down the line. For example, the video discusses how the viewer can create a free logo using some resources that I personally use but, since the video is long enough (as @denisegoldberg can attest to :wink: ), I'll have to come back to that topic in a future video. Ultimately, my mission is to help people focus on their craft and less time on keeping a business running. You guys have been great and thanks again! Ultimately, my mission is to help people focus on their craft and less time on keeping a business running. That sounds good in theory, however, every successful professional photographer spends far more time on business than on pictures. Meetings, contracts, shot lists, marketing, etc. Photography is service industry first, and a product industry second. I can understand why you would think that photographers would need a website, because we are a visual business a way, but quite honestly, a well known working photographer doesn't need a personal web presence at all. Here's a simple breakdown for photographers. If you want to sell images, get your images to where buyers are. That is never, ever, a personal website. There are companies that focus on selling art, it is an entire industry in and of itself. No need to reinvent the wheel here. If you want people to hire you, go to where the clients are. That is never, ever, a personal website. If someone is hoping that people are going to hire them based on a pretty website, they won't be in business long. Think about photographers like you would a waiter/waitress. I don't care how great the food is, a lousy waiter/waitress can ruin it. On the other side of that, a superb waiter/waitress can make up for some slightly better than average food. I'll use myself as an example. Come Sept, I'll have been making my living with a camera for 26 years. I'm nowhere near the best photographer. Heck, I can go onto any forum and find people who take far prettier pictures than I ever will. I can search the web and find millions of prettier websites. So why aren't these others more successful than I am? The reason that I've made it this long has nothing to do with cameras or pretty pictures or websites. It is because I show up every single time and I deliver every single time. There are zero excuses in my life when it comes to business. No web presence can make up for that. I was bored and decided to give it a try. First, I got a "bad gateway" when I first hit your site. Later it worked. But a "how to build a website" that doesn't work first-time, every time, is not good. Next, I tried edge and chrome in parallel, and the spacing was wildly different. Edge had tiny, tiny print, and huge spaces between "summary" and the video frame; screen shot below. It's even a bit odd that the disclaimer is already expanded in edge and not in chrome. Ooops... just hit the "get support" link and got "502 Bad Gateway" with the name "nginx" below it. Second time in 5 minutes. I still think it's too long. Some people will need to know how to get a domain name, but some already have one -- tough to skip. Some will want to use Bluehost, those that may either have their own or want alternatives will lose interest while you show how to buy from Bluehost. Same with almost all aspects of this. If it's going to be video, consider having it be 4-6 different videos of 5-10 minutes each, max. People have short attention spans, and want only what they need at the time; while you had nice photos and a good voice, they really aren't going to want to watch all the unimportant (to them) parts just to listen to you. Anyway, for what it's worth. @Ferguson This is great feedback and I appreciate the time spent here! I just reached out to my hosting provider and they said they are under a DDoS attack and that is affecting the consistency of the web page (grrrr). I'm looking into changing webservers now and should have a new host in place ASAP and I totally get your point of having a site that doesn't work! Luckily this is a one off case, but it still should not happen! As for the feedback on my site layout, I'll keep that in mind going forward. My home site is made using a different theme and I'm curious how the actual portfolio demo site looks on Edge (www.portfoliodemosite.com). I'm also curious how many people actually using Edge as a browser, even though I want to make sure everything is sorted out! You bring up a great point about the text tutorial and I am actually in the process of updating my site with that as well. This way viewers can work with just the video or the text version - or even both for that matter. Last but not least, I did consider breaking up the video into more digestable pieces and might do that for the next video(s)! Again, this is great feedback on my very first video and thanks for not being hard on me! I promise to learn and improve! Well, ddos attacks can happen to anyone. THough how well they respond is relevant. Edge is currently about 5% of the world market, 6% of US, if I trust the sites I found. Growing though, and I'd hazard to guess a lot of people with newer PC's use it because they don't know how to change (whether that translates into people who don't know how to do web sites ...?). Interestingly Firefox looked like Chrome (i.e. good). But really, themes for wordpress (etc) should work on Edge as well. I looked briefly at the portfolio site and it looked good on edge.